Scarecrow Press Historical Dictionary of Portugal (Historical Dictionaries of Europe) by Douglas L. Wheeler, Walter C. Opello | Free eBooks Download - EBOOKEE! Posted on 2012-09-18, by sharebookfree. Portugal is a small Western European nation with a large, distinctive past replete with both triumph and tragedy. One of the continent's oldest nation-states, Portugal has frontiers that are essentially unchanged since the late 14th century. The country's unique character and 850-year history as an independent state present several curious paradoxes. As of 1974, when much of the remainder of the Portuguese overseas empire was decolonized, Portuguese society appeared to be the most ethnically homogeneous of the two Iberian states and of much of Europe. This, in spite of the fact that Portuguese society had received during 2,000 years of infusions of other ethnic groups in invasions and immigration: Phoenicians, Greeks, Celts, Romans, Suevi, Visigoths, Muslims (Arab and Berber), Jews, Italians, Flemings, Burgundian French, black Africans, and Asians. Indeed, Portugal has been a crossroads, despite its relative isolation in the western corner of the Iberian Peninsula, between the West and North Africa, Tropical Africa, and Asia and America. Since 1974, Portugal's society has become less homogeneous as there has been significant immigration of former subjects from her erstwhile overseas empire. 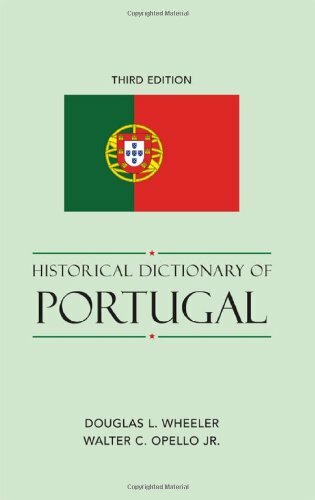 The third edition of Historical Dictionary of Portugal greatly expands on the second edition through a chronology, an introductory essay, a bibliography, and hundreds of cross-referenced dictionary entries on important persons, places, events, and institutions, as well as on significant political, economic, social, and cultural aspects. No comments for "Historical Dictionary of Portugal (Historical Dictionaries of Europe)".